Have you guys ever made your own breadcrumbs? I'm a huge fan of panko, so I usually just go ahead and keep a bunch in my pantry, but sometimes when I run out and can't be bothered to go to the store, I'll make up quick batches of breadcrumbs using whatever I have lying around. I've done it before with English muffins and here I've done it with brioche. This is part 3 of Tabasco’s 10 ingredient challenge – 5 different recipes made from any of these 10 ingredients: Tabasco, tuna, brioche, eggs, mint/basil/cilantro, dark chocolate, eggplant, cherry tomatoes, cider vinegar and maple syrup. Have you guys ever made your own breadcrumbs? I’m a huge fan of panko, so I usually just go ahead and keep a bunch in my pantry, but sometimes when I run out and can’t be bothered to go to the store, I’ll make up quick batches of breadcrumbs using whatever I have lying around. I’ve done it before with English muffins and here I’ve done it with brioche. The brioche crumbs give these crispy eggplants a crispy, delicate coat. Topped off with a quick cherry tomato sauce, these guys made a delicious afternoon snack. 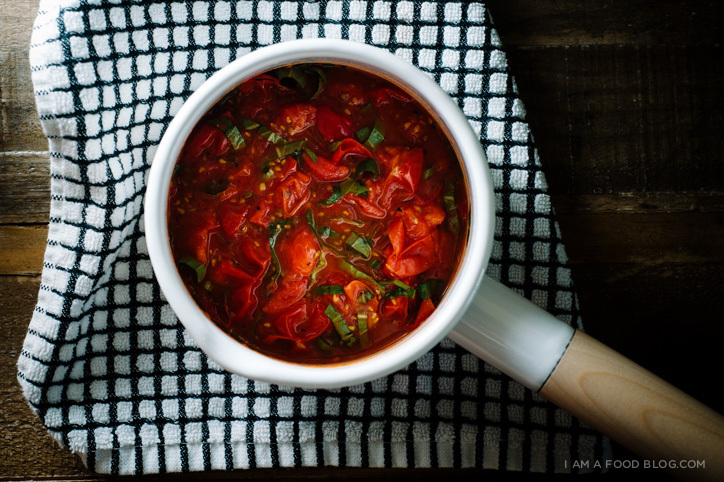 Make the tomato sauce: In a small saucepan, heat up the oil over medium heat. Add the cherry tomatoes and cook, stirring often, until skins have burst and tomatoes start to soften. Very carefully press down on the tomatoes to release the juices. Add chopped basil and season with salt, pepper and tabasco sauce to taste. Set aside. It should stay warm enough for when your eggplant is done, but if needed, reheat over low, while stirring. If the sauce is too thick, add water, a teaspoon at a time until desired consistency is achieved. Make brioche bread crumbs by pulsing old, dry brioche in a food processor until it resembles coarse crumbs. You should have about 1 cup. In a bowl, lightly beat the egg together with the tabasco. 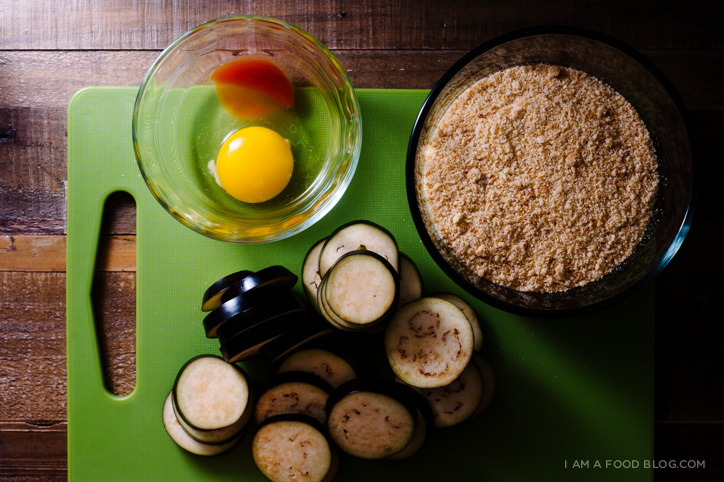 Dredge the eggplant in egg and then in the bread crumbs, pressing so they stick. 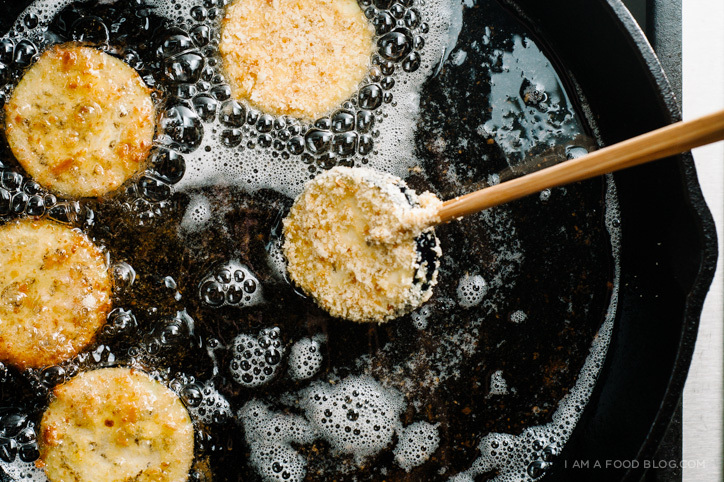 In a cast iron skillet, fry the slices in 1/2 inch of 375°F oil, until golden brown, flipping once, about 1 minute per side. Transfer to paper towels and drain. Season with salt and pepper. 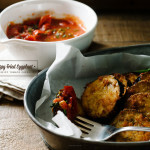 Enjoy with the spicy cherry tomato sauce immediately. Ermagawd brioche bread crumbs! You are on fire! Make this for me plz. I’m obsessed with you and your work Stephanie…..and I’m not afraid to admit it! You’re amazing! I want these so hard. Yum! I love eggplant so much, this looks awesome! I love how simple this is! 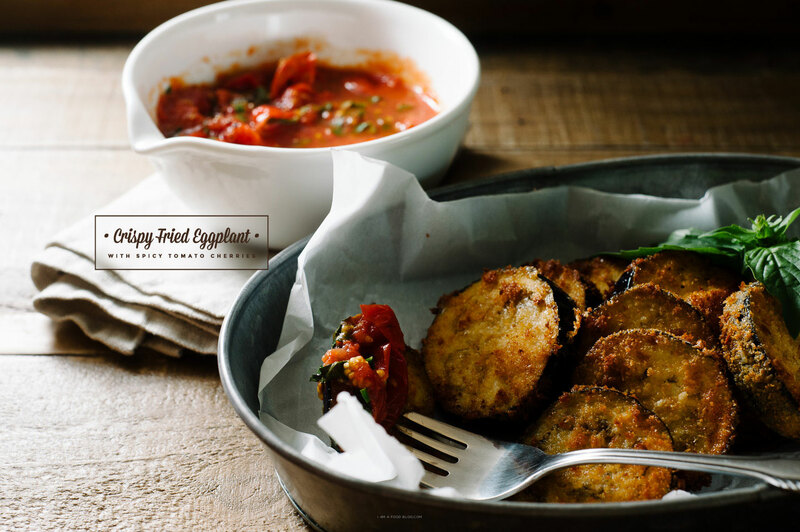 Plus, we are huge fans of eggplant! These look fantastic. 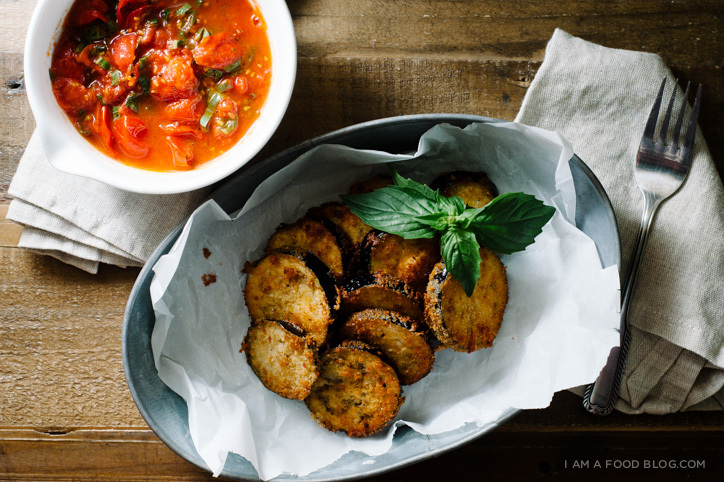 Just happen to have eggplant on hand… I think these will be part of dinner tonight! Aaah this is a recipe from my childhood minus the use of tabasco. I like how you updated an old favorite. Well done. Delish! Can I have some? Overall, day after day, eggplants are definitely in my top three food lists. I always search for eggplant recipes. This one looks great. Will try it. this blog is absolutely great!